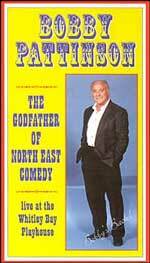 Bobby Pattinson is possibly one of the most successful of all North East comedians. He's travelled extensively around the English-speaking world, appearing in Australia, Canada and the USA, including the Sands and the Stardust Hotel in Las Vegas. He's topped the bill at practically every major theatre club in Britain, and has been voted Cabaret Comedian of the Year three times. Bobby returned to his native North East and opened the highly successful Talk of the Tyne Club at Gateshead in 1978. He likes nothing better than working with Northern audiences where he can ‘taalk proppa' and be understood. This video is of a live performance at Whitley Bay Playhouse, where he played to a packed sell-out audience. The standing ovation he receives is a tribute to his screamingly funny material, his professional delivery and his instinctive rapport with the fans.